I always have a soft spot for the BAFTAs. Once the bridesmaid of the awards season (it doesn't seem that long ago that they used to be in May! ), they're now widely seen as a predictor for Oscars success. Though the evening threw up a fair few surprises, the dresses were consistently gorgeous. I swear choosing my favourite looks for this post was the most difficult yet, because there were so many amazing looks on the red carpet, but I think I can safely say this was the best batch yet. It was also interesting to see the trends that have taken a firm foothold, with lots of block colour in pastel shades, but also the hangover from the winter trends and the merging of the two, such as Cate Blanchett's dress. There wasn't a massive amount to write home about in make-up and hair terms beyond Helen Mirren's berry lip; most of the stars went for something very toned-down and let their dresses do the talking. So, without further ado, here are my favourites. Lupita has been knocking it out of the park with her awards dresses - I loved the dress she wore to the Golden Globes - and this dress continues that trend. The mint green block colour works beautifully with her skin tone and I love that she kept the rest of the outfit simple with gold accessories and toned-down hair and make-up. Wow! Cate looks absolutely stunning in this dress; it hugs every curve but is still so flattering. I also love the details of the flowers - a nice touch of the beginnings of spring on what could have been a very wintry outfit - and the long necklace, which draws your eye down the dress and is reminiscent of something Galadriel might wear. Those little extras turn what could be quite a severe look into something beautiful and classic. Continuing the trend for women wearing trousers on the red carpet (see also: Ruth Wilson), Angelina looks fantastic in this YSL suit. It's beautifully tailored and is perfectly set off by her pointy heels, smoky eye make-up and tousled hair, giving the impression that she just fell out of bed after a night on the town, threw on the clothes closest to her and looked almost sickeningly fabulous. Best version of this look I've seen yet. Just gorgeous. The 'older' ladies were incredibly well dressed this year (I also loved Judi Dench adding splashes of colour to her classic black gown), but once again I have to put Helen Mirren in my list for this gorgeous sparkly number. It screams 'awards bash' and is fantastically glamorous without being too full-on. Love the berry lip and classic hair as well. 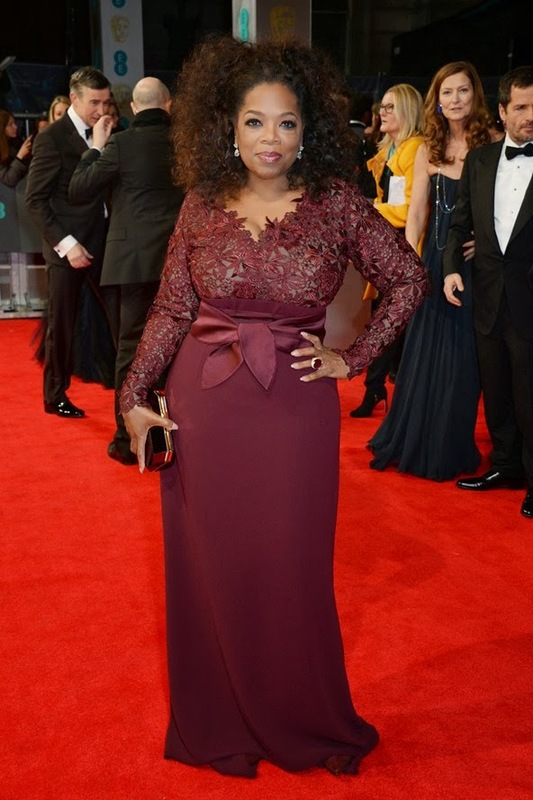 Oprah is completely rocking this dress. I'm a sucker for lace and sleeves, and this dress works perfectly on her - the beautiful plum colour looks stunning on her, and I like the fact that she's not shied away from the fact that she has curves but instead chooses to highlight her waist with a bow belt. Add in the natural hair and a cocktail ring that could probably have your eye out, and this is, as Craig Revel Horwood might say, "Fab-u-lous!" Samantha looks absolutely gorgeous in this Calvin Klein dress. It fits her shape beautifully and I like that it's edged up a bit by the belt and the almost beachy necklace. White dresses can sometimes look a bit bridal on the red carpet, but I think this works because it isn't too frilly or overloaded and because she's kept the rest of the look very toned down. However, I think what makes it work is her smile - she looks like she's having the time of her life! As regular readers of my Awards Show Fashion posts will know, I am a sucker for a gorgeous blue dress. Clashing blue is one of my favourite fashion looks in any situation and Gillian Anderson is pulling off this beautiful Balmain gown perfectly. You can't quite see from the photo but it ties at the back, which just makes me love it even more. Add in the slightly regal necklace and we have a winner. I'll be honest: I didn't get the love for Emma Thompson's Golden Globes outfit, which I thought made her look way too frumpy (though I loved her taking her shoes off on stage). Thankfully she pulled it out of the hat for the BAFTAs with this amazing red sheath. I am a big fan of red as regular readers will know and this was elevated by the unusual neckline of the gown. Keeping her hair and make-up natural just adds to the overall effect of the look; it's cool, classy and elegant. She also wore the most amazing white coat on the red carpet which had a brilliant Cruella de Vil vibe to it - perfect for a chilly February evening! This edition of Awards Show Fashion Token Bloke goes to Tinie Tempah. On anyone else this would look like they'd been attacked by Hugh Hefner's costume department, but on him it works brilliantly. 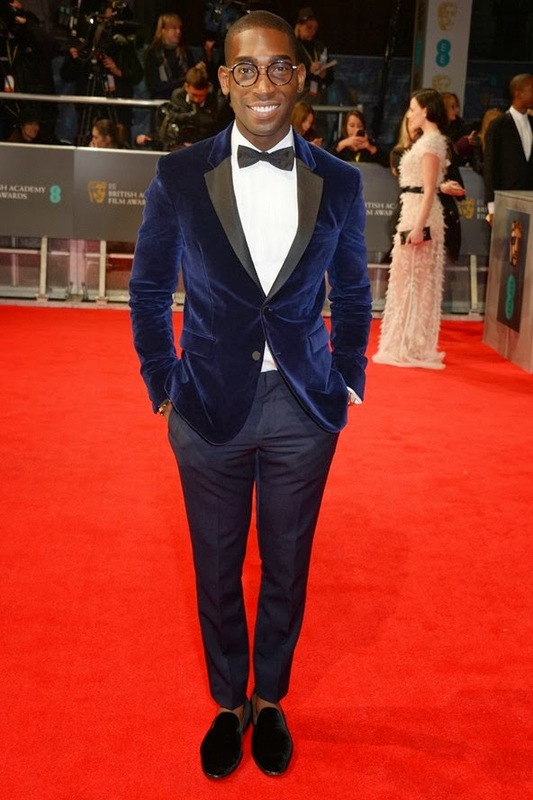 I like the blue velvet as an alternative take on a suit jacket and the glasses add just the right amount of quirk without going too far into Dalston hipster territory. Plus, I don't know any other man who could work velvet loafers quite so well. Did you watch the BAFTAs? What did you think of the outfits? Thanks Megan! I think Angelina's was my favourite look of the night; she just looks so cool in an 'Oh this old thing?' way.